Most depictions of St. Bartholomew (also known in the Gospel of John as Nathanael) fall into one of two categories – with skin or without. Legend has it is that he travelled throughout the known world preaching the Gospel before he was eventually martyred by being flayed alive and then crucified upside down. 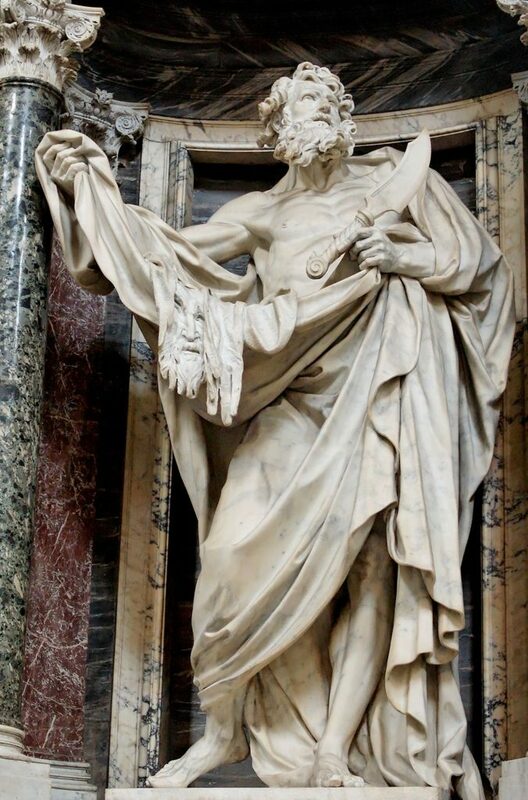 What I appreciate most about Pierre Le Gros the Younger’s depiction of St. Bartholomew (from the Archbasilica of St. John Lateran in Rome) is the fact that he is shown holding the knife and offering his flayed skin as a sacrifice to God, a symbol of his total surrender to the love of Christ that met him under a fig tree. 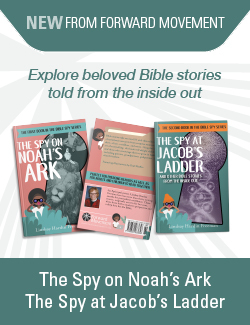 Bartholomew first learns of Jesus through the witness of Philip who tells him that he has found the one “about whom Moses in the law and also the prophets wrote.” Bartholomew is skeptical, but is invited by Philip to see for himself. What he finds is a man who notices him and sees him in a very profound way. This exchange between Philip, Bartholomew, and Jesus reminds me of the words in 1 John 4.19, “We love because [God] first loved us.” Before we notice Christ, he notices us and calls us. Jesus met Bartholomew while he was standing under a fig tree long before Bartholomew ever met Jesus. This example of God preceding grace moved Bartholomew so deeply that he immediately left all that he had and followed Christ. These questions are ones that are often considered by those in evangelical Christian traditions who describe themselves as “born again”; but my experience is that this question is not considered with the same intentionality in so-called mainline Christian communities. As difficult as it might be to ponder this question individually, scripture sets a clear precedent that peoples’ lives are changed the very moment that Jesus notices them. Each of us has a “fig tree” moment wherein the trajectory of our lives is altogether different because Christ notices us. I want to share with you a “fig tree” experience of my own, a space where I am certain I came face-to- face with the Lord of Life. It was baptism. Baptist churches practice Believer’s Baptism – baptism based on the profession of one’s faith. I am not sure how my mother got around this rule, but I did not actually ask to be baptized. Our pastor “opened the doors of the church” one autumn morning, my mom signaled to the usher, and the rest is history. That moment was a “fig tree” experience because I was carried into my baptism and my new life in Christ in the arms of my mother’s faith. I have a lot of conversations with Christians who have never thought about their spiritual journey with any intentionality. Many feel as though they do not have a story of God’s presence in their lives. What I have found to be true in most of these cases is that people do not lack spiritual experiences; they lack sufficient language to articulate and understand the experiences they have. They assume such things only happened to Bible characters or great religious women and men. But I deeply believe that each of us has at least one “fig tree” experience when God comes really close to us, where we come really close to God, and where we were empowered to go forward far beyond our own strength. Do yourself a favor today: think about where you see God in your life and the life of your family. Talk it out. Write it down. Share stories of faith. You might be surprised at what people might have to say. Bartholomew truly believed in Christ and instantly followed him through the darkness of Calvary, to the glory of the Resurrection, to the utmost parts of the world and beyond. His journey began by being noticed. Maybe ours begins by noticing. What might your ‘fig tree’ moment be? Great article – it did make me think about such moments in my life, so thank you for that. I also like this rendering of St. Bartholomew; I hadn’t heard the story of his martyrdom before I saw it, and couldn’t understand what I was seeing. Shocking, in a way, but also profound in that he’s shown as whole in his body. Thank you! Writing this piece was a great opportunity to reflect on my own “fig tree” moments… and to learn more about Bartholomew’s gnarly death. “His journey began by being noticed. Maybe ours begins by noticing.” <— Love that. Thank you! Thank you. It’s a helpful spiritual practice for me… one that is easier said than done.